Let’s get the combat sports cliché out of the way right now. Everybody loves heavyweights. Think of this: Two nearly 300-pound freight trains hurtling at each other with four-ounce gloves and bad intentions behind everything they do. 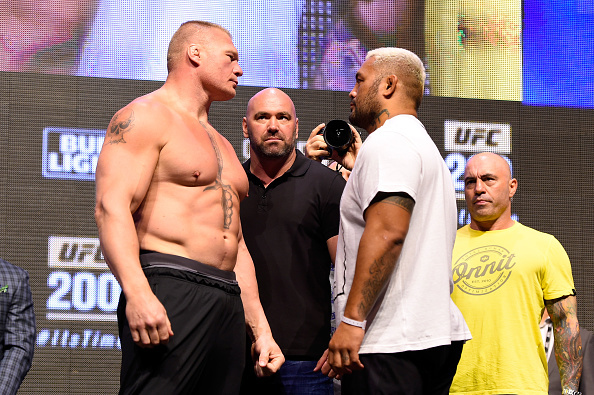 The co-main event of UFC 200 will feature two of the baddest men on the planet in Brock Lesnar and Mark Hunt. If you’re keeping track at home, the two weighed in at a combined 530 pounds Friday morning, and it’s a safe bet that neither Hunt (264.5) nor Lesnar (265.5) will be in that vicinity on fight night. Tune in to UFC 200 on Saturday night and you’ll find out why heavyweights are such an attraction. First, a former UFC heavyweight champion, Cain Velasquez, tries to secure a shot at wearing the belt for a third time when he tackles 6-foot-6 1Ž2 power puncher Travis Browne. That’s a main event-worthy bout in its own right, but at T-Mobile Arena, it’s only an appetizer for heavyweight fans. That’s because after Frankie Edgar faces Jose Aldo for the interim UFC featherweight title and light heavyweight champion Daniel Cormier faces Brazilian icon Anderson Silva in a non-title bout, Lesnar and Hunt will literally collide. THAT is why everyone loves heavyweights. Sure, there may be a brief feeling out process once the Octagon door closes and the referee waves both into battle, but it should last as long as Lesnar decides to blast ahead and try to put Hunt on his back. Unless his clandestine training sessions have him working on some new tricks, the big man from Saskatchewan will be seeking a takedown and a finish on the mat. It’s the former NCAA Division I wrestling champion’s bread and butter, and while any tap from his monstrous fists can cause anyone to wobble, Hunt is a former K-1 champion who has been punched and kicked by the best. As such, his chin is rarely dented, despite the presence of his last three losses to Stipe Miocic, Fabricio Werdum and Junior Dos Santos coming by knockout. Against Werdum, he got caught with a perfect knee, the Dos Santos defeat came at the end of a three-round war, and Miocic did his damage with a steady ground-and-pound clinic. And it’s that fight against the current heavyweight champion that Lesnar and company are probably looking at. Either that one, or Hunt’s debut UFC loss to Sean McCorkle back in 2010. Both show the blueprint for beating “The Super Samoan,” which is to get him down and submit him or beat him up. And if Lesnar gets an opponent to the mat, he is not likely to let him back up. Sounds simple enough, but to get close enough for a clinch or takedown, any fighter risks incoming fire, and few have more bazookas at their disposal than Hunt. The King of the Walk-Off KO, the 42-year-old from Sydney has ended his last five victories by knockout over Frank Mir, “Bigfoot” Silva, Roy Nelson, Stefan Struve and Cheick Kongo. And while he seems plodding at times with his footwork, UFC light heavyweight Tom Lawlor recently pointed out to me that Hunt’s handspeed is what makes him so dangerous. So if Hunt doesn’t have the footwork to avoid Lesnar’s rushes, he most certainly has the speed to fire off one of his bombs – particularly his uppercut – should the WWE superstar get too close. It’s this push and pull that has the fight world buzzing, and it doesn’t matter whether Hunt lands a knockout blow and walks away or Lesnar grounds and pounds his way to victory, because as long as these two are in the Octagon, you will be watching and you will be on the edge of your seat. And if you didn’t love the heavyweights before, by the time July 9 turns to July 10, you will.